I’m incredibly blessed to have had the opportunity to work on such a high profile website. The Street Tourist Information Centre website is is the place to find all information on Street, Glastonbury and other neighbouring towns and villages. The website also required a news section to publish articles and a shop with basic e-commerce functionality. It also required a partner website for the neighbouring town of Glastonbury at glastonburytic.co.uk. I redesigned the site using the latest design principles and modern techniques. The look and feel is very contemporary with the use of a bold and striking imagery and colours as you first enter the site. 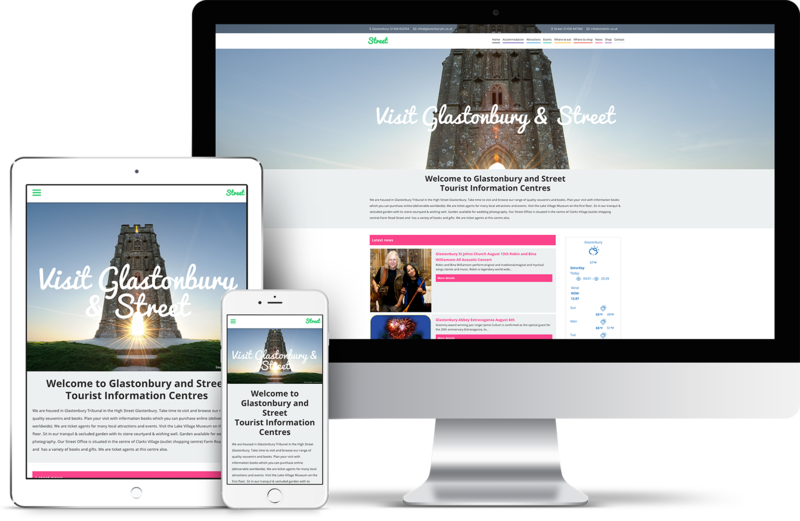 Bright colours are used throughout the website to keep consistency with the partner site for Glastonbury Tourist Information Centre and separate sections of the site so that it is clear where you are and what you are viewing at all times. The previous content management system was replaced with a brand new one, much more suited to the site. It was replaced with WordPress because its extensive set of features and plugins that I knew would be suitable for the job as well as making it easy to manage the sites content. It had to be customised to suite the needs of the website and make it as easy as possible to manage the large amount of content. The same site was used for both streettic.co.uk and glastonburytic.co.uk. This meant the site could be centrally managed and would draw all traffic into a central place which is good for search engine optimisation. You can visit both website at streettic.co.uk and glastonburytic.co.uk. I designed this website from scratch starting with an initial concept and wireframe and moving onto the final designed website. Street Tourist Information Centre is a large website so their has been extra attention to detail with the usability of the website.